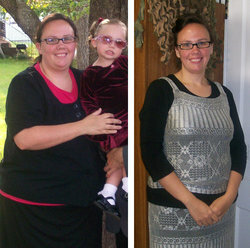 Inspired by her daughter, Tabbyrabbit has lost over 70lbs and isn’t the “fat mommy” anymore. 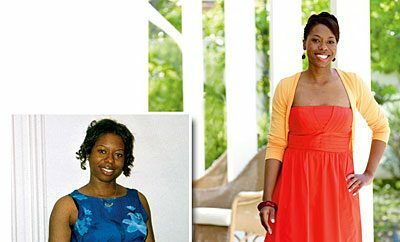 In her story she explains that changing her mindset and incorporating healthy food choices with exercise has her “rolling” down hills and enjoying every moment of it. In February of this year my daughter who is three wanted mommy to go out and play with her, but I was just too tired. I told her just that. She looked at me and said: “No mommy, you are too fat to play with me.” That brought tears to my eyes. After years of wanting a baby and finally going to doctors to get help and have her, I turned out to be too fat to play with her. That’s when I decided to change. The question should be what haven’t I tried. I have done Weight Watchers, Atkins, liquid diets and even tried not eating. The most important thing I think I have changed is my mindset. Until I set in my mind that I did have to workout and no – I was not going to die if I did not eat that cake. It was a very emotional ride for me. Now my lifestyle is very different. I go to the gym three days a week. I just eat lean meats, lots of veggies, fruit and of course drink lots of water. I think the most important change for me was my attitude. I was very depressed. I lost my mom two and half years ago very suddenly and then three months later her brother passed away, so I ate to cope. I realized my mom would want me to be happy and living to my fullest which I was not doing. So every morning I now get up and say: “Today is a new day and yesterday is past”. It helped me by allowing me to research which foods were healthy and which ones were not. I was surprised by some. I love that Calorie Count has grades by the food. It also was a meeting place to go and meet new people who were just like me and trying to lose weight also. Motivation to me was the most challenging. I started off doing this with my family, but they have since dropped away. Having to do this journey on my own was a real challenge. I had to keep motivated by going to the gym and looking at my daughter. Well the first month I lost 19 pounds, but I really didn’t see a change in my clothes until about last of April. When my daughter in law came over one day and she told me we have to go through my clothes closet. As we started going through things I realized everything was falling off me. She told me I have been wearing my clothes way too big and it was time to get rid of them. When she left I had 5 pieces of clothing left. I knew then I had made a huge difference. Also when our local newspaper did a story on me, I thought: “Wow, I am a success”. I get up every morning and say: “Today is a new day, yesterday is gone.” So it doesn’t matter what I ate yesterday because that day is gone. Start fresh today and go on about your day. I can go out and play with my daughter. For the first time since I was a little girl I rolled down the hill. My little girl wanted mommy roll down the hill and I told her let’s go. Boy, that was so much fun and just to see the look of happiness on her face was priceless! I can run and not get winded. I can jump and not get tired. I can walk for miles and enjoy the nature without having to sit down. That’s how my life has changed. Today is a new day and yesterday is gone. You cannot fail if you do not try. After each failure, just simply get up and try, try, try, until you get it right. Just think you can have new clothes. Could there be a better reason than that! ?